CHICAGO (CNS) — Dominican Sister Gabriella Williams in the Diocese of San Bernardino, California, gives her heart and soul to her ministry with migrant field workers, hourly laborers and their families living in trailer parks in California’s Coachella Valley. 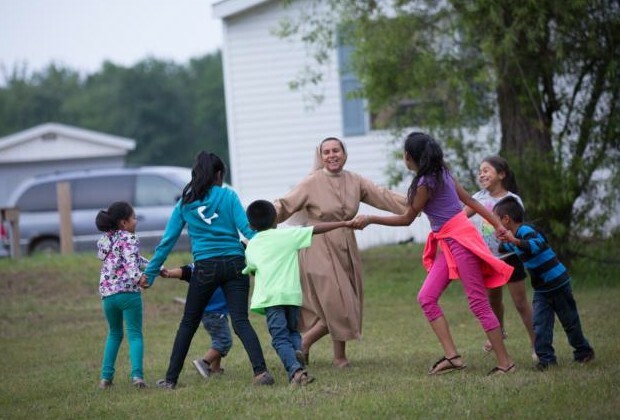 Sister Rita Schonhoff, a School Sister of Notre Dame, and Dominican Sister Maria Yelitza Ayala live out their religious vocations by serving desperately poor communities in Missouri and Texas, respectively. Benedictine Sister Kathleen Atkinson from the Diocese of Bismarck, North Dakota, is the founder and director of Ministry on the Margins, working with prison inmates, former prisoners, the homeless, at-risk youth and others who need to encounter God’s love. These religious sisters and many more around the United States are being highlighted by Chicago-based Catholic Extension as part of National Catholic Sisters Week March 8-14. The organization is sharing the stories of Catholic sisters who work in the U.S. mission dioceses it supports by sharing their stories online at www.catholicextension.org/catholic-sisters-week-2016 and via social media. Through the week, daily posts were to be made on Catholic Extension’s Facebook page at facebook.com/catholicextension and on Twitter at twitter.com/cathextension using the hashtags #NunsRock and #NCSW2016. Other stories highlighted come Catholic Extension’s U.S.-Latin American Sisters Exchange Program, an initiative that has placed 33 Latin American women religious in dioceses throughout the U.S. to minister to the church’s growing Hispanic population. Catholic Extension, a national fundraising organization, has been supporting the work and ministries of U.S. mission dioceses since it was founded in 1905. National Catholic Sisters Week, which is supported by a $3.3 million grant from the Conrad N. Hilton Foundation, is an annual celebration held in conjunction with National Women’s History Month, observed in March. The organization is based at St. Catherine University in St. Paul, Minnesota. PREVIOUS: Alabama conference examines depth of black-white divide in U.S.